So after 5 more hours last night of tweaking my 2 month cross country road trip, I find out this morning that it will all have to be changed again. Bono had to have emergency back surgery today causing U2 to postpone its tour opener in Salt Lake City June 3, with probably more shows going to be postponed. 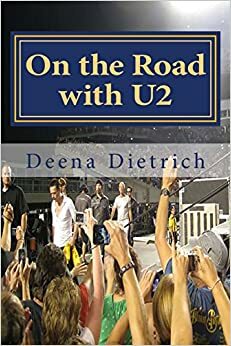 I was shocked to hear that Bono had to have surgery but when it sounded like he was going to be ok, I then thought about my road trip and all the changes that I will have to make. I’m lucky though because I won’t lose any money, as so many others will with their flights, because I’m driving and all my hotel reservations are changeable. I’m also lucky that I have the time to reschedule this trip to whenever the shows are rescheduled. I’m so OCD that I need to know now what the changes are to the tour, so I can change my road trip accordingly. So I’ve been obsessively searching twitter, facebook and u2 fan sites to see the latest news or gossip. There is indication that part of the stage is headed to Minnesota, which indicates Minnesota should be one of the first 3 shows meaning Anaheim, Denver and Oakland may be postponed as well. Hopefully these shows will in fact be postponed and not cancelled because I was looking forward to seeing all 12 US shows and super excited to be reporting on them for u2tourfans.com. The good thing is maybe they will be rescheduled in an easier route for me, as I was going to have to do a lot of backtracking with the previous schedule. I still want to travel route 66 though. Hopefully we will hear something definite Monday or Tuesday because I was supposed to leave Wednesday, and I have many hotel reservations to cancel and hopefully reschedule. The sick thing is that I’m looking forward to replanning my entire road trip. Here’s to a speedy recovery Bono! Don’t come back too soon. We can wait. With the only news today being that the Glastonbury festival is looking for possible replacement for U2 and that Bono is going home to Ireland to recuperate, I decided it was time to make a Plan B. Someone reminded me that U2 may not cancel the Anaheim shows until the day before, and I can’t drive to California in a day. Plus I still want to go on my route 66 trip regardless of what happens with the U2 tour. I have decided to leave Friday and drive out west along route 66 as scheduled, which will bring me to Flagstaff June 2 & 3. Surely by then U2 will have announced whether or not they are having the shows in Anaheim. If they do, then on with my already scheduled trip. If U2 cancels Anaheim, but still have Denver then I will head northeast to Denver. If they cancel Denver and start with Oakland, then I’ll continue to Vegas and up the coast of California to Oakland then Seattle and so on. But if U2 postpones the entire tour, then onto Plan B, which is a tour of the South including parts of route 66, Texas and Louisiana. I feel better now that regardless of what happens with the U2 tour, I am leaving this Friday and will be on the road visiting places I’ve never seen. Still wishing Bono a speedy recovery. I woke up at 7am and immediately checked for news of Bono and the upcoming U2 tour. After 3 long days of waiting for any kind of news, I was inundated. Bono’s condition was more serious than I had thought. Thankfully though, he is going to be alright after at least 8 weeks of rehabilitation. The entire North American leg of the U2 360 tour has been postponed until next year. So far the European shows are still on. I have been planning this road trip for months. I was to leave tomorrow. Now there is no u2 tour. So is there no road trip? No way! I have been looking forward to this for months. I can still go. After much deliberation of where to go, I decided to keep part of my original road trip in tact. I’m going travel a portion of route 66 from Tulsa to Albuquerque. I have always wanted to visit Albuquerque and Santa Fe, and that’s what this year is about – visiting places I’ve always wanted to visit. After Albuquerque I’ll travel back through Texas – from Lubbock (home of Buddy Holly) to San Antonio to Austin to Dallas. Then to Shreveport LA (home of the Louisiana Hayride where Elvis headlined) and back to Memphis before heading home to Maryland for 2 weeks where I’ll attend my 20th high school reunion. Then in August I’ll go to Chicago for Lollapalooza and then back to Memphis for Elvis Week.